I'm back at the Crafters Marketplace last Monday with my son Gabi. 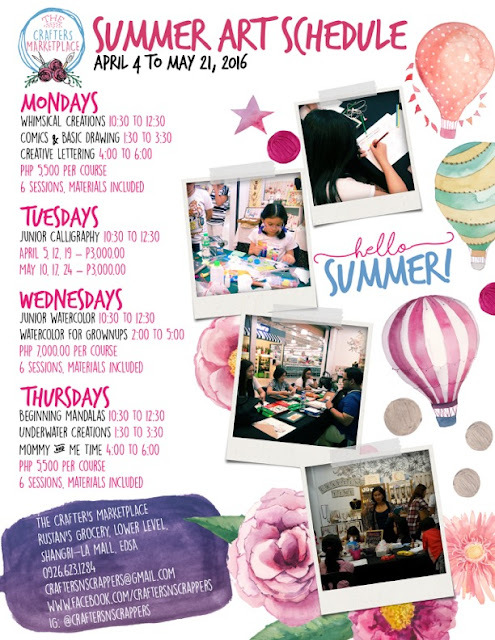 I attended the Creative Doodling and Coloring Workshop with other Mommy Bloggers last April 08, but this time it was Gabi's turn to join one of the creative activities for this summer, thanks to Mommy Bloggers PH! We arrived early in the workshop area and there I finally met one of the owners of Crafters Marketplace, Ms Alma Borruel-Ramirez who welcomed us. We were also greeted by Ian De Jesus, the resident artist. I introduced him to Gabi and boasted that he is the same artist who taught Mommy about doodling and the one who made the doodled wall. Gabi was astonished! I went to the store while Gabi was left in the workshop area and I was stunned with the new items available which were not there before. 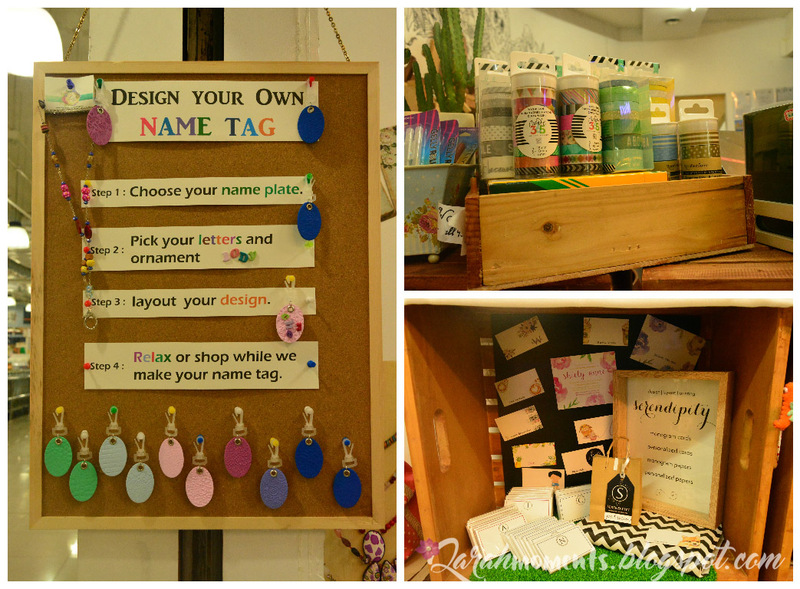 They now have the Design Your Own Name Tag, handmade and made of Polymer Clay, wide array of Washi Tapes (Oh how I love them!) and the newest addition, Serendipity for cards and gift tags. Visiting their store is so refreshing. I love the feel and the colorful sight! The theme for this workshop was, "Internet Safety for Kids and Families", which is sponsored by Trend Micro. "Trend micro is a global leader in IT security, they develop innovative security solutions that make the world safe for businesses and consumers to exchange digital information." As we all know, internet plays a big role in our everyday lives. It is very accessible to everyone yet using the internet is not without risk. There are always threats and vulnerabilities. And since our kids are also using the internet every now and then, they are also susceptible. Ms. Alma started the activity by giving a talk about Trend Micro's Click Right Advocacy which aims to promote Internet Safety for Kids and Families (ISKF). She explained some risks and internet safety tips that the kids along with the parents can do to optimize security against possible attacks. After the talk, Ian gave some tips and tricks on how to use oil pastel. He made some demo which gave our kids a good idea on how to use this medium. After that, the kids were asked to draw Basic Internet Safety Practice and to use Dong-A Oil Pastels to color it. Gabi used the technique of smoothening by using oil pastel and rubbing it with tissue paper. It's a bit messy but you'll love the result. Nonetheless, "Creativity is messy". Agree? Gabi's Art Work says, "Overtime of Internet causes radiation!" I marveled at how each kid came up with their own interpretation of the subject. Thanks to Crafters Marketplace and Ian De Jesus for bringing out their creativity. Truly, "every child is an artist". As a parent, it is our responsibility to set the rules and limitations when it comes to internet. It is also our duty to equip them so that they know how to protect themselves when faced with possible cyber threats. It is good to know that we are not alone in this dilemma. Above all, let's continue to pray for our kid's protection. The enemy can use any medium to destroy our kids. But we have a sovereign God, "The Lord will keep you from all harm-- he will watch over your life.." (Psalm 121:7 NIV). Don't miss out the fun! For more details, inquire at The Crafters Marketplace. 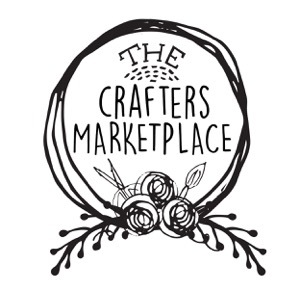 Would definitely check out Crafters Marketplace. My youngest loves art and crafts and certainly like a visit to this place. So many cool stuffs to see and do. I'm sure you'll love their place Mommy Juvy, especially the workshop area. I just hope this kind of internet safety talk would also be available in schools to constantly remind students of the effects of "talking" to strangers and posting just anything on social media. That's a very nice idea Mommy Berlin. 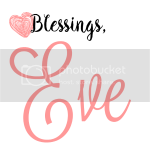 By the way, nice meeting you on the Blogapalooza. Yes Mommy Nilyn, it's a good investment for kids and it's free! Oil pastel is something I've never tried before. That workshop is so nice because it's 2in1. I tried calligraphy there too and I had a great time. I hope to try all the other workshops too. Awww what an enjoyable and fruitful activity! I'm sure you had a grand time! Nice to meet you also Mommy Tetcha and your son! Gabi is such a big boy na! We should really instill to our kids some of the disadvantaged of too much internet. My kids are not on the age yet of using internet but I should know the basics safety once they get their hands on the computer. Yes, miss ka na raw nia. I want to learn new things this year and water coloring and hand lettering are few of the things on my list. You're lucky to be able to attend this workshop. I hope you can join next time Mommy levy. That is such a great workshop for kids! It unleashed their creativity. I have been seeing a lot of of posts about these summer workshops, I sure hope we were able to join one of their activities. 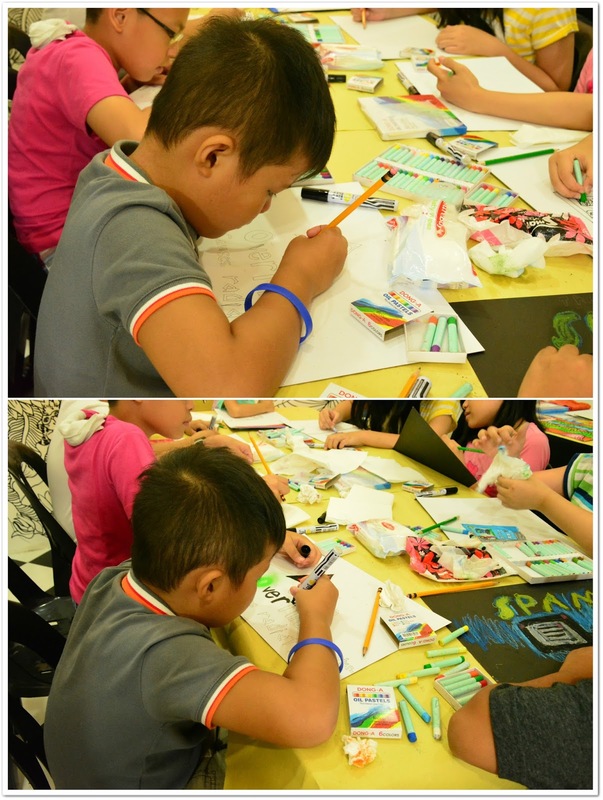 Kids can learn a lot from making crafts and doing artworks. It sure would've been a great way to spend their summer vacation. 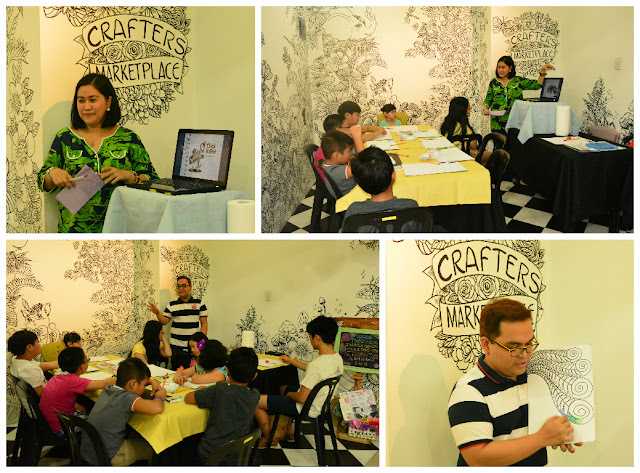 I attended Basic Calligraphy Workshop at Crafters Marketplace and it was really a fun learning experience. Their workshops are perfect for kids to enjoy this summer season. I hope i can also try their Calligraphy, would love to learn it. Internet is an important topic and should be discussed properly with kids. The teens and I had a session about it and we even watched a movie called Trust which hit the point even more. Wow! That's nice Mommy Louissa. Thanks for sharing. It was.. thanks you Mommy. I didn't know there was such a place in Shangrila Mall! With more kids playing online games these days, it's really best for them to be well-versed with internet safety. I agree. You actually wouldn't know there's an art workshop beside the supermarket. But it's very noticeable because of the doodled wall. Oh my gee! I know Alma! She used to be a colleague of mine! Kaloka! Anyhow, I love the kids art work and will definitely would love to visit the place too!